It's the State of Health (SoH) field that you want to look at. You are down to 79% so I think you will carry on dropping to 70% and get a new battery soon. That's right, you're at 79.1% battery health. Once you hit <= 70%, you will get a new battery pack. Nevertheless, in my opinion, it's worth taking in your car to the dealership now and get an official State of Health (SOH) report, just to confirm that what you're seeing in Torque is accurate. Just know that it may/will end up costing you $100+ for the report (if you're over 70%). If you don't mind, could you create a new thread for your car? That way we can monitor the condition of your battery pack separately. I'd like to keep this thread as sort of a diary regarding my vehicle. SOH is down to 107.4%. 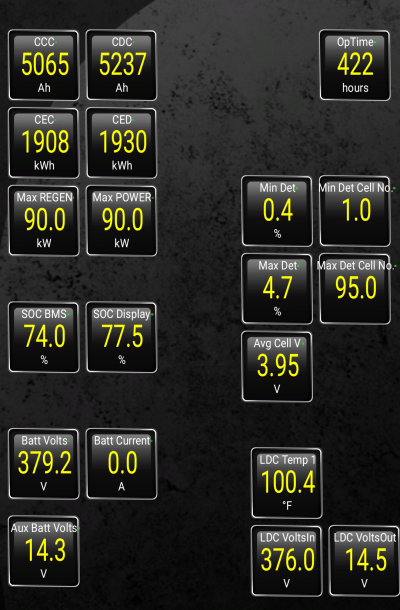 The Min/Max cell voltages look good (both are equivalent). However, the Min/Max deterioration values have changed. 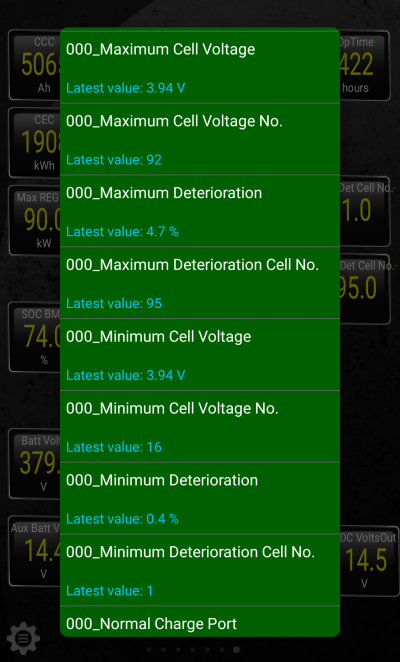 The max det is at 4.7% on cell #95, and the min det is at 0.4% on cell #16. This is up from 0.1% from 2 months ago. What kind of program for android are you using? What is it called? TorquePro, costs about $5. It's a bit challenging to download the codes the OBD device sends to the phone. I don't think it will necessarily matter which dealer you take it too. The less technical explanation is they will hook up to a port (OBD) in your car to check your battery state of health (SOH). This is what is discussed above. 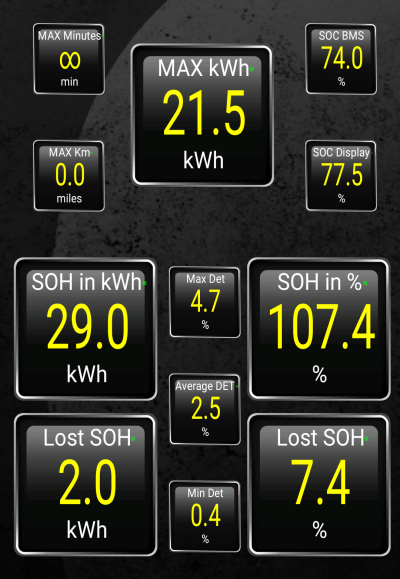 When your battery SOH drops below 70% is what triggers the warranty. I'm currently at about 62 miles on a 100% charge, so I'm also getting close. You might want to wait a bit before heading into the dealer. If they test your car and it shows 71%, you might just have to wait a few more weeks for it to drop below 70% and trigger the warranty. Once the dealer test shows less than 70% you should either get a new battery (more likely) or they restore your battery to 70% by some means (less likely). Thanks - sounds like a plan. Thank you, Kish, for the wonderful thread by a very informed consumer. I'm researching EVs before getting myself in too deep and regretful. plus some awful labor charges. by the warranty. I did find used pull-outs from wrecks for under $16,000 but there's no data on how much power is left in those.